Click to see an enlarged version. 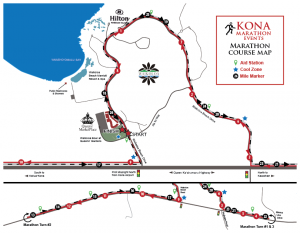 Runners will be on the Kona/Kohala Coast of Queen Ka’ahumanu Hwy between Mile Marker 74 and Mile Marker 80. Waikoloa Beach Drive will be one way entering at Waikoloa Beach Resort Signal Light and exiting at Waikoloa Village Signal Light. 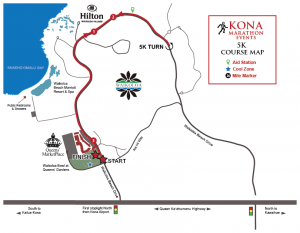 Short delays may be incurred entering and exiting the Waikoloa Beach Resort. 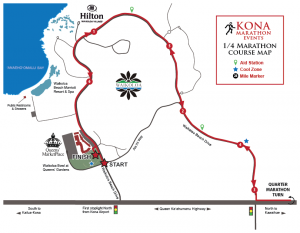 Queen Ka’ahumanu Hwy will remain open in both directions throughout the day. 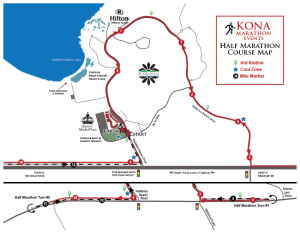 Runners will use the coned off (west) makai shoulder separating them from traffic. Motorists are advised to use caution between the hours of 4:00 am & 1:00 pm in this area. If you have any questions, please search the FAQ page or Contact Us.